The Quietus | News | BREAKING: Nick Cave Statue Update! BREAKING: Nick Cave Statue Update! A long-rumoured statue of Nick Cave looks set to finally appear in his small Australian hometown in Western Victoria, according to a Guardian report. Cave was born in Warracknabeal, which has a population of under 3,000, in 1957. 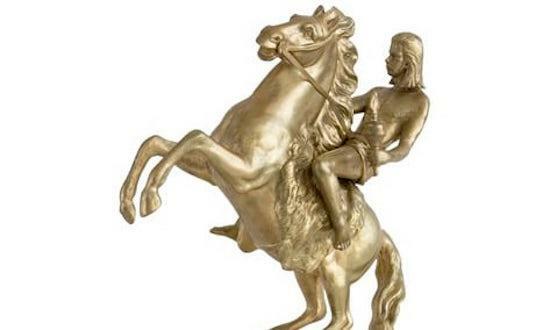 The small country town, known for its water birds and the Yarrambiack Creek, may now see the addition of a Corin Johnson-designed, oversize bronze Cave effigy, astride a rearing horse, naked save for a loincloth and brandishing a flaming torch. According to the report the sculpture has been discussed since the 90s, but the idea has now reportedly taken a step closer to fruition with the involvement of local Cave fan Nick Loy, who plans to crowdfund a campaign "with the support of his arts council colleagues." Miniatures of the statue are reportedly already circulating. Some are in Cave’s possession, and others have been displayed in the Melbourne Arts Centre. The proposed likeness has encountered some resistance. Loy suggested that Warracknabeal had been advertising Cave’s links with the town of late "as a way to drive tourism", but stated that its design had "proved controversial and caused some delays in community support." Perhaps anticipating a response of this type, an earlier plan for the mounted Cave was "driv[ing] it into town on the back of a ute and dump[ing] it" for the townspeople to discover "like a shining trojan horse." Cave characterised the loincloth as "modest" in 2009. As specified by the same report, the statue is estimated to cost roughly $200,000. A local bronze foundry is also "confident" that the project can be completed to specification. If the funds amassed exceed the campaign goal, the remainder will be donated to the Cave Youth Arts Foundation.